Sadly this year I wasn't around for Mothers day after a trip up to the Mighty Deerstalker event in the Scottish Borders. Over the years I've often had events on Mothering Sunday over the years and always try to make up for being away. Mum's favourite treat for Mothers Day is not having to slave away in the kitchen so we regularly take her out for a nice meal. Mum's usual choice has often been The Hutt up at Ravenshead but a rather weak meal last year put a number of us going back and with the relatively recent re-opening of the Lambley down the road from our parents house it made logical sense to book in at the Lambley Village Kitchen. The Lambley Village Kitchen was originally a village pub which then became the Lambley and turned into a bit of a gastropub which despite initial success didn't succeed in the long term. It's now back in business with a refurbishment and under the management of Ridge and Furrow Inn's who also own the Wilford Green at Wilford on the opposite side of Nottingham. On previous trips to the Lambley it always felt a little lifeless and unfinished but it's makeover has added a real homely element that adds to your comfort and ease. The main bar area is open to drinkers as well as diners to catch the local trade whilst the surrounding dining area feels like somewhere you could easily relax with friends and family. 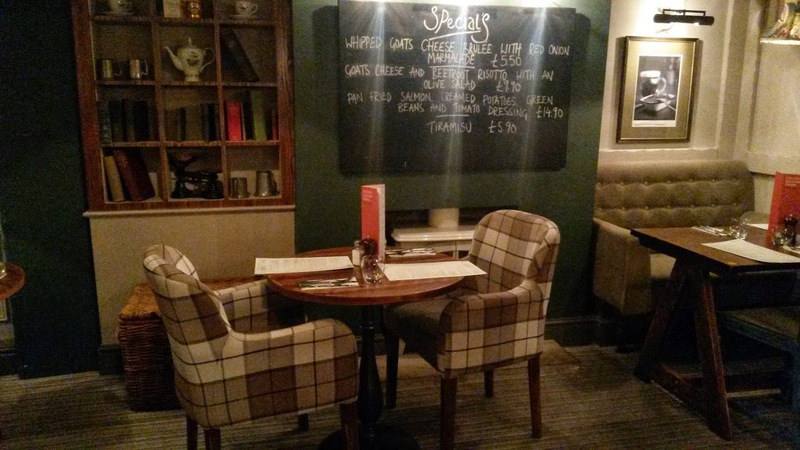 The menu at the Lambley features a varied selection that should satisfy most diners. There are plenty of vegetarian options and they love their food fresh so encourage local produce. 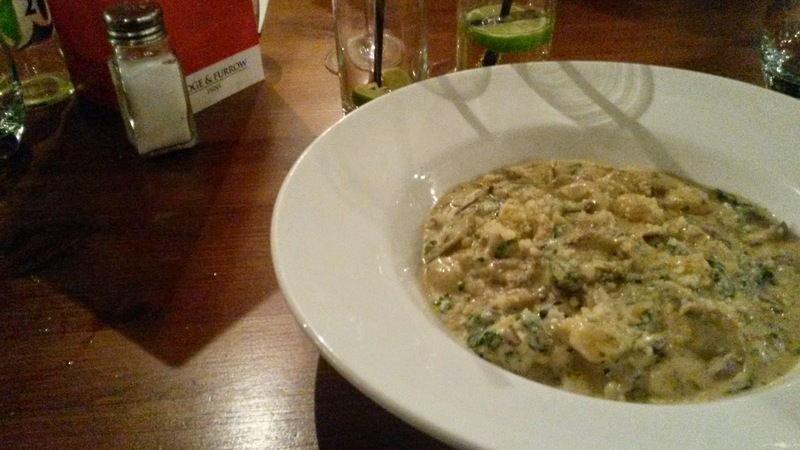 With the option of 2 courses for £13.90 and 3 course for £16.90 for dinner the food is good value as well. 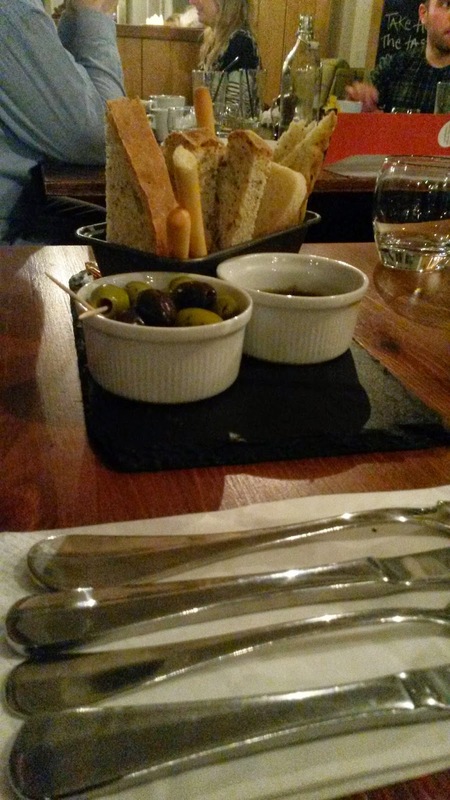 We opted for the 2 course for £13.90 option to keep costs reasonable and were not disappointed in the slightest. Simple yet very effective. 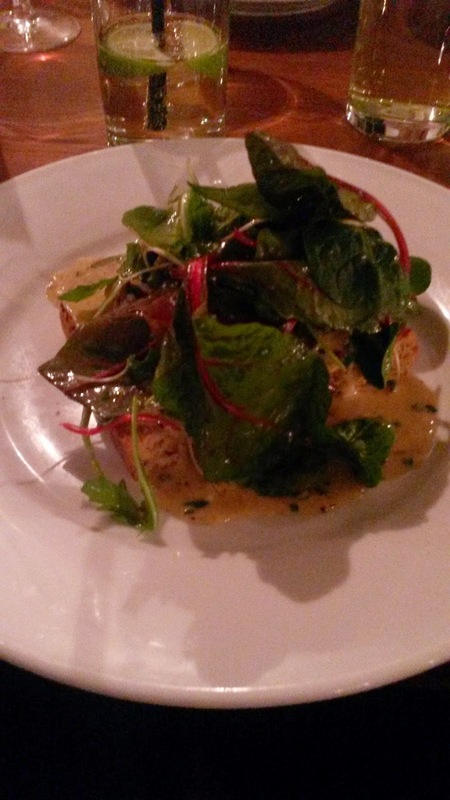 The Mushrooms on toast was served in a lovely cream source and with a generous amount of green leaves. The sauce meant it was a little more like soggy bread but the edges did have some crunch and the creamy mushrooms were lovely. You can't go wrong with bread and olives if you love your carbohydrates. The bread tin was of a generous size with around 6 slices of bread, a nice size serving of olives and an olive oil/ balsamic vinegar dip. 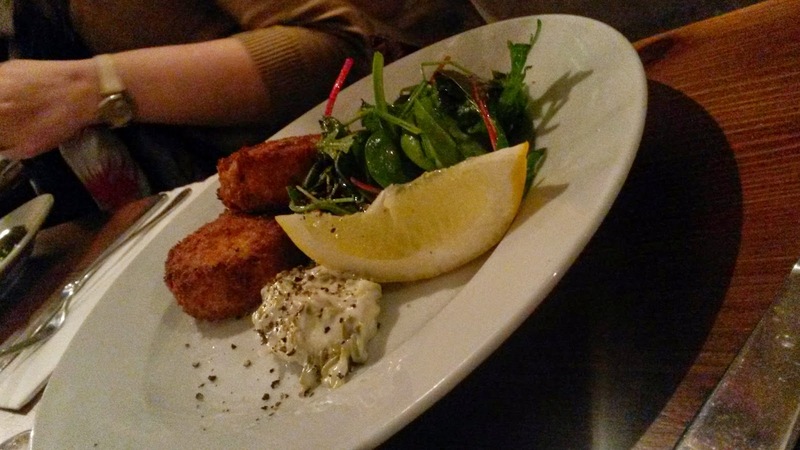 Mum opted for the fish cakes and said they were lovely. Again a decent size and served with a generous dollop of tartar sauce and seasonal greens. My gnocci arrived soft, creamy and easy to devour. The mascaropone sauce had a lovely syrupy sweetness to it alongside the peppery elements of the spinach. The sausage and mash came out looking simple yet beautifully presented with chunky pork and leek sausages alongside fluffy mashed potato and green beans with a rich onion gravy. Secretly I think we wished we'd all chosen this. 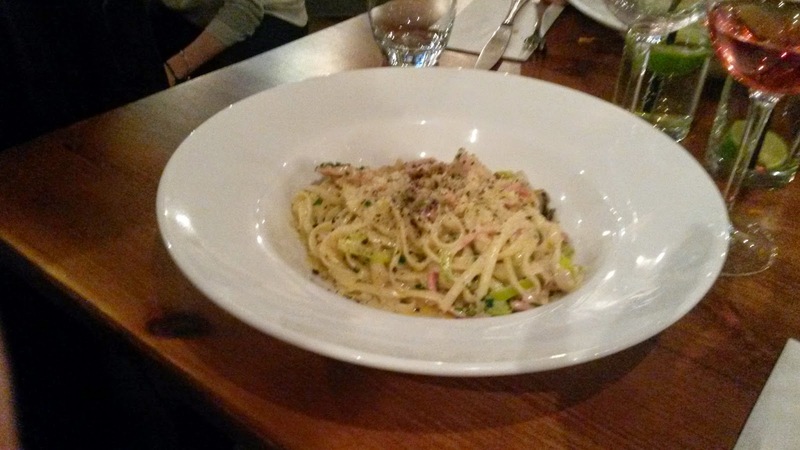 Mum opted for the chicken and bacon linguine which arrived in a rich and creamy sauce. The chicken and bacon were in good sized chunks and mum really enjoyed her main course adding she would happily come back and eat it again. 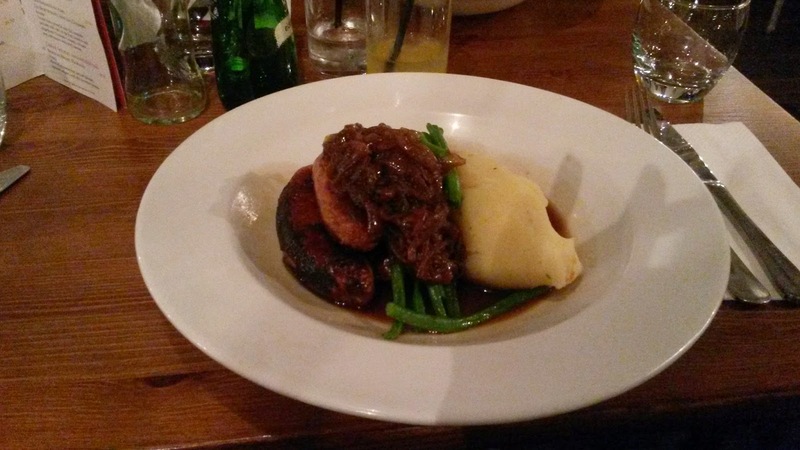 We had a lovely meal at the Lambley Village Kitchen. 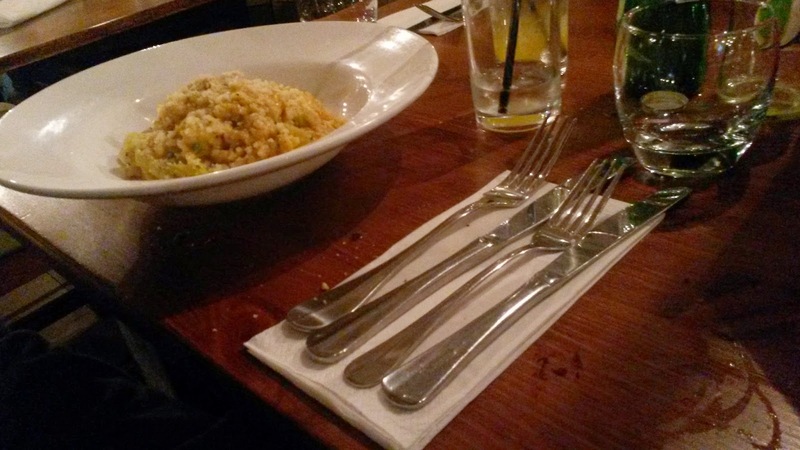 The food was fantastically prepared, there was a nice, relaxed atmosphere about the place and most importantly- Mum liked it and it was her treat. We'll definitely be back again as the food was also reasonable on the wallet.